I’d thought about making Pickled Quinces yesterday but opted for something more comforting. Mrs. McAuslan contributed this recipe to The New Galt Cook Book (1898) for the Pickles section. There are several recipes using quinces in this cook book so I was happy to find some at the Kitchener Market on Saturday. 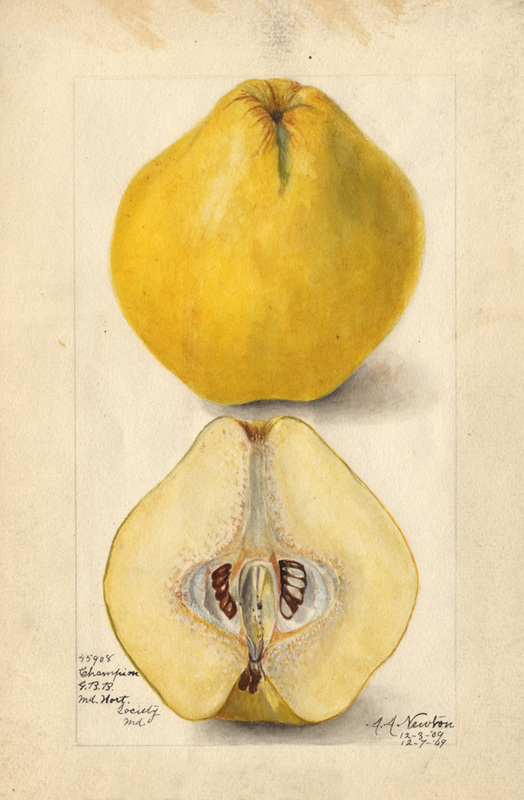 A 1909 watercolour of a Quince by Amanda A. Newton. From G.B.B., Maryland Horticultural Society. So what are quinces? Well, they are a fruit that grows on trees and they are related to apples and pears. However, I can’t imagine ever biting into a quince the way I do with apples and pears. The quince is very hard and sour — almost bitter or astringent — and yet it has a wonderful perfumed aroma. I haven’t worked with this fruit in two years and I’d forgotten just how difficult they can be to peel and cut. I peeled a large quince and then started trying to cut it into quarters and finally eighths. The fruit is very hard so I was a little scared I’d cut myself as I prepared it and especially as I tried to remove the core. It was so much work I decided to just try the recipe with 2 quinces. I weighed the cut fruit and found I had just over 12 ounces. I put it into a saucepan and added 9 ounces of white granulated sugar. I covered the pot and turned the heat low. As the sugar started melting and the juice started to come out of the quinces, I turned the heat up a bit. I stirred every so often and once it came to the boil I added the vinegar. I used a bit less than 1/4 cup of pickling vinegar since the recipe calls for strong vinegar. I added just a little less than 1/4 teaspoon of ground mace, cloves and cinnamon. Later I discovered it was supposed to be whole cinnamon but this seems to have worked. The fruit looked a bit like peaches at this point. I let it boil without the lid for 6 minutes. Next I used a slotted spoon to remove the fruit and put it in a container. Then I left the liquid to boil and get thicker. I wasn’t sure how thick it might become and I was worried I would reduce the liquid so much that it wouldn’t cover the quinces so I removed it from the heat after a few minutes. I poured it over the quinces and was ready to taste. Mrs. McAuslan is most likely Christie Carrick. She was born in the Galt area in 1840 to John and Christie and married Scottish born John McAuslan. His parents brought him to Canada when he was about ten years old. John became a cooper and was about nine years older than Christie when they married. They spent their lives in Galt and had about eight children. One of their daughters died when she was fourteen months old of some sort of inflammation. John died 1910 and Christie died of endocarditis in 1916. Pickled quinces are a surprise — a good surprise. The cooked quince tastes very good and the pickling solution just enhances it. The fruit has the slightly grainy texture of a pear and the tart taste of an apple and yet the flavour is still distinctive. The spices, sugar and vinegar are well-balanced with the fruit. I’m not sure what I’ll do with my pickled quinces except eat and enjoy. If you can locate some quinces I recommend trying Mrs. McAusland’s recipe for pickled quinces. Quinces, sugar, vinegar, one teaspoonful whole cinnamon, one teaspoonful cloves, one teaspoonful mace. Peel and core the quinces. If small cut into quarters, if large into eighths. Weigh the pared fruit and take sugar in the proportion of three-fourths pound to every pound of fruit. Arrange the quinces and sugar in alternate layers in a preserving kettle and bring them slowly to a boil. To every five pounds of fruit and sugar together allow a cupful of strong vinegar and a teaspoonful of cinnamon and cloves and mace. When the syrup boils add spices and vinegar, and boil six minutes. With a split spoon remove the fruit and spread no flat dishes, leaving the syrup to boil until it thickens. Pack air-tight glass jars with the fruit, fill to overflowing with the boiling syrup and screw the tops on tightly. Pears, peaches, plums, crab apples are all good pickled according to the above recipe. I’ve often wonder why jars of mixed pickles always seem to have just one or two pickled onions. It’s a bit like the cans of fruit cocktail with just one cherry. I can’t help you with the fruit cocktail but if you are a fan of Pickled Onions perhaps the recipe in The New Galt Cook Book from 1898 can help. It was contributed by Miss Wardlaw. One of many companies preparing pickling spice mixtures for sale to grocers. I don’t really like pickled onions so I wanted to test the recipe with just a small amount. I was able to buy a bag of the small white onions at my grocery store. I took a handful and peeled them. Apparently this can be done easily by popping them briefly in boiling water but I did it by hand instead. I put them in a small saucepan with 1 cup vinegar and 1 cup water. I boiled them for 10 minutes and then drained them. I put the boiled onions in a jar. Next I prepared the seasoned vinegar. I put 2 cups vinegar in the saucepan and added 1 dried red pepper and 1 tablespoon of mixed pickling spice. I assumed that the red peppers in the recipe were dried since fresh would need a similar treatment to the onions. What do you think? Did I make the correct decision? I also wasn’t sure about the mixed spices. 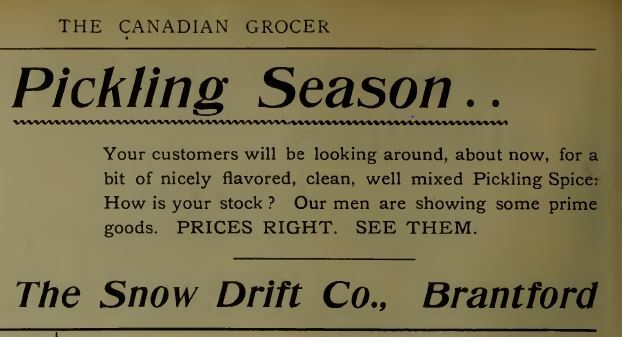 This instruction leaves room for you to use whatever spices you like but mixed spice and pickling spice are mentioned in the Canadian Grocer trade magazine in 1898. The pickling spice mix I bought in 2014 contained mustard seed, coriander, by leaves, dill seed, fenugreek, cinnamon, ginger, allspice, cayenne pepper, black pepper, cloves and some oil. I added just one small dried chili pod since the mix included it already. I left the spices to boil in the vinegar until the spices were a bit less dehydrated. Should I strain the spices or include them in the jar. I decided to keep everything together and poured it all over the onions in the jar. It was time to follow the usual canning procedures to seal and store the pickled onions but first I wanted to sample one immediately. Miss Wardlaw is familiar to me from the number of sick room recipes she contributed to the cook book. She was Margaret (Maggie) Janet Wardlaw daughter of John Wardlaw and Mary Ann Davidson. Her parents were from Scotland but she was born in 1862 possibly in Oxford County where the family was listed in the 1861 census. By the time she was nine they lived in Galt Ontario where her father was a woollen manufacturer. He was a bronze medal winner for his woollen yarns at the Philadelphia Exposition in 1876. In 1891 Maggie was living at home with her parents and several of her brothers. One is a dentist and she’s a nurse at the hospital in Galt. Although her parents were still living in 1901 the census shows Maggie is living with her brother who is a doctor. It is just the two of them plus a servant. I assume that Maggie is acting as the nurse for her brother’s medical practice. I think by 1911 she’s living in Toronto but I’m not sure and I don’t know how she ended up there. She died of a heart condition in Newmarket in 1931. Her brother Thomas was the person providing details for her death certificate. He’s a commercial agent and living on Scott Street in Toronto so I suspect that’s why Maggie ended up there. Her obituary appears in the Newmarket Era newspaper on October 30, 1931 but doesn’t provide any information. I’m not a big fan of pickled onions but I like them better than most cucumber pickles. The onions tasted like onions but the vinegar was interesting and the chili pepper gave it quite the kick! It will be interesting to taste again after a few weeks to see if the onions have absorbed much of the seasoned vinegar. There are many versions of pickled onions. Some use malt vinegar as a base, some are sort of sweet and sour, and then there is Miss Wardlaw’s spicy version. If this 1898 recipe sounds like the kind you like then give them a try. They are easy to make and look nice in a plate of mixed pickles. Get the small white onions, peel them. Boil in vinegar and water, about half and half, for ten minutes; drain, and put in bottles. Have vinegar boiling which is well spiced with red peppers and mixed spices, pour over the onions while boiling. What comes into your mind when you think of pickled beets? There doesn’t seem to be a middle ground with beets, and especially with pickled beets. You either love them or hate them. I think I’ve always liked beets but I acquired a taste for pickled beets as an adult. I’ve made various types of pickled beets and some were good and some were okay and a few were horrible. Tonight I’m trying an anonymous recipe for Pickled Beets from the Pickles section of The New Galt Cook Book (1898). Beets. Photo by Candice Leyland. Don’t worry. You do not need a peck of beets, or even know the equivalent to a peck, to be able to make this recipe. 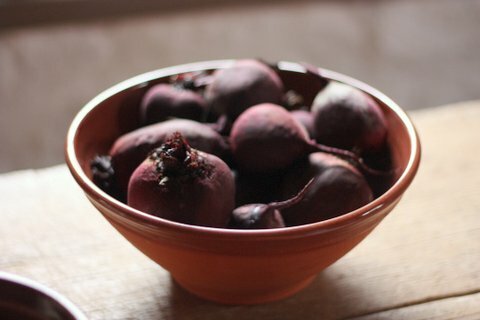 Six beets is the base used to establish the ingredient proportions so any amount of beets can work if you do the math. First I boiled some medium-sized beets for two hours. Once they were peeled and cooled a bit, I sliced them into a canning jar. The next ingredient is a slice of onion per beet. What is a slice of onion? Is it a ring? I cut slices from a huge onion and used more than a ring and less than entire slice since it was such a large onion. For every beet there was an onion slice in the jar. Next I added the 1 teaspoon of horseradish. I had a jar of prepared horseradish in the fridge since I haven’t been able to get horseradish root yet this fall. Finally I added the spices — 6 whole cloves and 1 tablespoon whole pepper corns — to the jar. I heated some vinegar and poured it into the jar until it covered the ingredients and was just 1/4 inch below the top of the jar. The recipe says to wait until everything is cold to put a ring and lid on the jar but I did it immediately. In 1898 you’d set this in a pantry or cold cellar and leave it until you needed it however, the original recipe instructions don’t come close to meeting today’s preserving standards. I chose to put my jar in the fridge to be safe but to preserve the beets for longer storage the jars and lids need to be sterilized and everything should be hot when put in the hot jar. Then it should be given a hot water bath as indicated in modern canning recipes. I’m making such a small amount that short-term fridge storage works for me. If I like them, I’ll make the recipe again using modern techniques. Although I tasted the beets after an hour in the fridge, it is really too early to judge this recipe. The spices need to mix with the vinegar and then soak into the beets. Right now it is a nice fresh pickle but doesn’t have much flavour beyond beet. I’ll let you know what they are like after a week. I prefer the type of beets pickled with a bit of sugar in the vinegar so I expect these pickled beets to be good but not great. Time will tell. Boil tender half a peck of beets. They should cook at least two hours slowly. When thoroughly done allow a slice of raw onion to every beet. Slice them into a jar, put in a teaspoonful of horse-radish, six cloves, and a tablespoonful of whole peppers to every half dozen beets. Pour boiling vinegar over them and set them away. When cold cover. One of the special things I bought at the market on Saturday were gooseberries. Normally they would be preserved as soon after picking as possible but they seemed in good shape still so I’m going to use them in Mrs. Irwin’s recipe for Spiced Gooseberries. It appears in the Pickles section of The New Galt Cook Book (1898). How familiar are you with gooseberries? I’d never tasted them until I worked in historic houses with gardens. Gooseberries aren’t very tasty as a raw fruit. They really need to be cooked in a pie or a dessert called a fool. If this recipe is anything to go by they are also good as a pickle! I weighed my little pint container of gooseberries and found I had not quite a pound so I’m cutting this recipe and making a one-sixth batch. As usual this stretches my math skills but here goes. First I washed, topped and tailed the gooseberries. Topping and tailing is removing any stem and blossom still attached. These gooseberries were a nice striped green colour. I weighed the sugar to get ½ pound and put it in a saucepan. Next I added 1/3 cup of vinegar since 1 pint equals 2 cups. Then I measured 1/3 of a tablespoon of ground cinnamon and 1/3 tablespoon of ground cloves and sprinkled in a bit of salt. Once it was cooking I added the prepped gooseberries and let the mixture boil for 1 hour. I kept my eye on it to ensure it didn’t burn and stirred occasionally too. The berries changed to a reddish colour and many of them burst like cranberries. I wonder if I should have pricked them. Initially I expected this to be gooseberries preserved in a syrup but instead it was more like a relish or spiced jam. It was time to taste. Mrs. Irwin is a bit of a mystery. The first time I looked for her I couldn’t find her but I’m giving it another try tonight. I found Christina Irwin who is listed as head of a household in 1901. However, she’s listed as single but there’s a 10-year-old girl named Mary Irwin in the house who is listed as her daughter. There are four people lodging in the house and another man George Nichol who is listed as Christina’s brother. He’s listed as married. I really am at a loss for the time being. When I can search with greater speed again at home I’ll try to decipher the traces of Mrs. Irwin. This recipe for spiced gooseberries produces a nice thick pickle. The cinnamon and cloves are very strong so I think I’ll ease back on them just a touch if I make this recipe again. I actually liked the tart and spiced flavour and could see gooseberry pickle on the table to accompany various meats, a bit like cranberry sauce is used for turkey. Make a syrup of three pounds sugar, one pint vinegar, two tablespoonfuls ground cinnamon, two tablespoonfuls ground cloves, one-half teaspoonful salt, add six pounds fruit, and boil one hour. Now that summer is here a wealth of fresh vegetables soon will be available along with the challenge of preserving them in some way. I discovered this interesting recipe for India Pickle contributed by Mrs. Howie of Waterloo for The New Galt Cook Book (1898). There are two more recipes with the same title but this one allows for vegetables to be added gradually over the season. This recipe is a bit challenging simply because there are so many ingredients to measure and most of that involves weighing them. Step one was finding a jar. As noted all the spices are whole rather than ground. I’ve decided to list them below to help ensure that they are all added. My equivalents are approximate. I’m also not entirely sure my method is correct but here’s what I tried. First I weighed the spices black pepper corns (2 oz), whole cloves (1/4 oz), whole allspice (1 oz), and mustard seeds (2 oz) and put them in a large jar. Next I added the 3 nutmegs whole and the 3 blades of mace. I decided to add the alum as part of the spices. Mine was so old that it had become lumpy so it was easy to pick out a small lump (about 1/2 teaspoon) and add it to the jar. I also added the coarse salt to the jar. Next I put 1 gallon of white vinegar in a large cooking pot and started heating it. I also mixed the ground mustard powder and the turmeric powder with vinegar. It took quite a bit of vinegar to get it mixed together. I stirred it into the vinegar before it was boiling but it still ended up a bit lumpy. I think my mustard and turmeric were more like a paste and should have been more liquid. Once the vinegar was boiling I poured it into the jar of spices etc. Finally I peeled some fresh root ginger, cut it into chunks and weighed until I had the 2 ounces. I also peeled and weighed cloves of garlic unil I had 1 ounce. I needed just one peeled shallot to have 1 ounce. The garlic, ginger and shallot went into the jar. I wasn’t sure about the chillies. Is this fresh chillies or dried. I’ve left them out for the moment until I can decide. Right now I only have small dried Thai chillies which I think would be far from what was used in Galt in 1898. Mrs. Howie is probably Mary Ann Gardham. Born in 1838 in Kingston, she married Alexander Howie and had five children. She died in Waterloo in 1923. Ironically after preparing this pickle I had to go to a Tim Hortons in order to write and post this blog. My internet was knockedout in a recent storm and so I sit in that most Canadian of institutions listening to voices speaking all sorts of languages (my neighbourhood is very diverse). It somehow seems appropriate since this is “India” pickle. As a country still part of the British empire, Canadians could be familiar with some foods of India — another part of the empire at the time. Most dishes originating in India or influenced by India would be altered by this time and yet this pickle is quite strong making me think that hot peppers will be suitable. I tasted my still hot pickling liquid before leaving the house tonight and it smells wonderful but still tastes of vinegar, salt and mustard. I think it will take a while before the spices blend with the rest of the ingredients. Just imagine what garlic, shallots and ginger combined with mustard and all the wonderful spices will bring to any vegetables I choose to add to the jar! I’ll be updating this post as the pickle progresses. One gallon vinegar, two ounces ginger, quarter ounce chillies, two ounces black pepper, one ounce garlic, two ounces coarse salt, quarter ounce cloves, two ounces mustard seed, three large nutmegs, one ounce allspice, one ounce shallots, three blades mace, small piece of alum. Boil the vinegar and pour over the spices. Quarter pound mustard, two ounces turmeric powder, steeped with a little cold vinegar, and add to the vinegar just as it comes to the boil. Put the spices in a dry jar and pour the boiling vinegar over them (all the spices must be whole), and then put the vegetables in as they come in season. I’m back cooking in my own kitchen again after a few days away. Two years ago I often had to cook in strange situations but I’m out of practice now. I also haven’t made pickles for a while and I know it seems odd to make pickles in April but I was able to get a bag of Macintosh apples cheaply. In 1898 I think apples would be coming to the end of their storage life. This would be the time to do something with them before it gets warm and the apples get soft. I’m making Sweet Apple Pickle using a recipe Mrs. Hugh White of Branchton contributed to the 1898 New Galt Cook Book. You can still find Branchton on a map. It is in North Dumfries Township in Waterloo Region and less than 10 km from Galt Ontario. Macintosh apples are my favourite. They are sweet, generally smaller than other apples, and best of all they originated in Ontario long before 1898. I think they are a good choice for this recipe. However, I have no intention of using 7 lbs of apples and ending up with jars and jars of this pickle. I will make half this recipe if I can figure it out. The directions are a bit lacking in detail, common in this cook book. It seems to be intended primarily for women who knew how to cook but needed ideas. I know from making this sort of pickle that I need to boil the sugar and vinegar and spices but that isn’t mentioned in the recipe. Some of the other recipes on the same page give added information. For example a recipe for sweet tomato pickle says “Make a syrup of the sugar, vinegar, cloves and cinnamon. Boil until a little thick and pour over the tomatoes.” That’s what I plan to do for the apple pickles. First I weighed the whole apples until I had 3 1/2 lbs. That turned out to be the entire bag containing 9 apples. Then I pared the apples using a paring knife (but you can use a peeler if you want) and cored and sliced them into quarters. I boiled the 1 1/2 lbs (3 3/4 cups) of white granulated sugar and 1/2 pint (1 cup) of white vinegar in a pot with 1/4 of a nutmeg grated and used my judgement about the number of cloves (a pinch of whole cloves) and a couple pinches of cinnamon. Even better would be to use a cinnamon stick. I let the syrup simmer and boil until it was a bit thicker and then added the apples. I cooked it longer until the apples were tender but not mushy. Skim out the whole spices if you want to maintain the colour and flavour or leave them in for a darker, richer flavour. Then the next step is to preserve the pickles in canning (sealing) jars. In 1898 that would be simply pouring the hot apples and syrup into hot jars and putting on a rubber ring and glass lid and screwing down the metal ring on the Mason jar but today we tend to process the jars afterwards to ensure that they are safe. I took one of the apple quarters fresh from the pot to taste. Mrs. Hugh White of Branchton has me a bit confused. Part of the confusion is due to the changes experienced in Dumfries Township. This particular township ended up split between two counties so North Dumfries is in Waterloo and South Dumfries is in Brant County. I think Mrs. White is Janet Wallace. She was born in Scotland around 1835 and came to Canada when she was about 7. Her parents settled in Wellington County. She married Hugh White in March 1858 and had her first child in 1860. Four more children followed but unfortunately two of their daughters died as young married women of kidney disease. Hugh died just a few years after Janet in the early 20th century. I’ve never liked cucumber based pickles but I enjoy fruit pickles like sweet apple pickle. The combination of vinegar, sugar, and spices along with apple is great with all sorts of foods. It goes well with a roast pork or chicken or include them along with other pickles as part of appetizers. This particular recipe balances the vinegar and sugar nicely. It isn’t overly tangy and I seem to have used just the right amount of spice. I’m tasting it the same day but the flavours will blend even more after a month or so if the spices remain in the syrup. I recommend getting the syrup going before you start preparing the apples. Otherwise the apples start to turn brown before the syrup is ready. Try this recipe in what ever proportion works for you. Use immediately for a milder taste or wait a few weeks for an even better sweet pickle. Seven pounds sweet apples, three pounds sugar, one pint best vinegar, half nutmeg ground whole cloves and cinnamon. Pare, core and quarter the apples. Dissolve sugar and vinegar,then put in the vinegar with nutmeg and some cloves and cinnamon. The same proportions do nicely with green tomatoes sliced, instead of the apples.